Mubadala Oil & Gas (MOG) existing set of leadership competencies were found to be inadequate and not well entrenched in the business. To complicate things there was also confusion between values and behaviours, which made it difficult to assess people against them. Finally they were not supporting the newly defined vision and direction for the MOG business. It became increasingly obvious that the leadership competencies had to be replaced. The goal was establish a competence framework that consisted of the key behaviours that was truly aligned to the new vision and widely used throughout the global organisation. The recruitment process were identified as one of the processes that had suffered the most from inadequate targeting of critical behaviours to success. Therefore the first step to be taken to embed the new competencies in the organisation had to be training of HR and Line Managers in behavioural based interviewing based on the new framework. The process put in place to develop the Competency Framework (CF) was divided into different step as described in the figure below. 2. The second phase was to design a number of behavioural based interview question. The objective was to support HR and Line Managers during recruitment interviews to better target critical behaviours. 3. The third phase was to develop and conduct Behavioural Based Interview Workshops along with a Interviewing Manual. The objective was to train HR and Line managers to conduct behavioural based recruitment interviews. 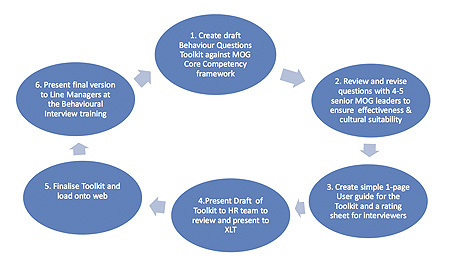 FLI provided MOG with a set of Behavioural Based Questions for all four levels. In close cooperation with MOG recruitment specialists FLI then outlined a 2 day interview training program targeting Line Managers along with a complete interview guide providing the tools and processes for successful behavioural interviewing. The interview was also discussed form a company branding perspective as it provides an excellent opportunity to promote the organisation, hence a risk of damaging its reputation if wrong handed. FLI supported MOG in conducting training workshops in the different countries throughout the region. Local HR Managers were closely engaged as co-facilitators. The country specific approached allowed for taking local conditions such as the employment market, culture and legislation into account. 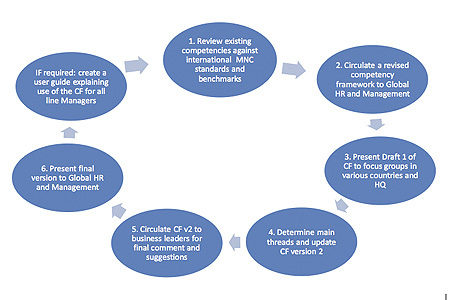 The Competency Framework was successfully rolled out in the global organisation. Line Managers and HR Managers were soon convinced of the impact it could have on different people processes in general and the recruitment process in particular. The Line Managers contribution during Talent Acquisition was hugely enhanced, helping them targeting critical behaviours during the interview and avoid recruiting staff that, in spite of meeting and possible exceeding the requirements in technical areas would fail to provide competent leadership in the MOG culture. It is yet too early to calculate on the ROI, however if the program helped avoid just one manager who would have failed to perform in terms of leadership and had to be retrenched and replaced within a year from the recruitment, the cost saving would have paid off the whole investment.